firearm and accessories laser engraving services! We are a licensed 07 FFL and able to work with any and all types of firearms and NFA items. 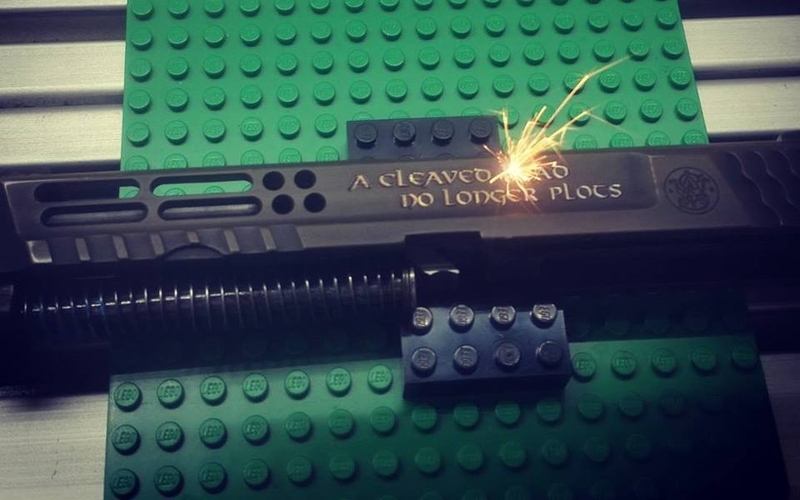 We are able to engrave a vast variety of materials and items, including but not limited to metals, reinforced polymer, wood stocks, magazines, knives, suppressors, holsters, etc. Send us your image or logo or let us design a custom image for you! We are also able to engrave department logos or badges on Law Enforcement/ Government Agencies firearms and accessories! From original designs to reproductions of corporate logos, military insignia and various commemorative themes and designs! Laser engraving is in most cases superior to traditional engraving as it allows for the flexibility of grayscale and multi tone engravings and FAST turnaround times. Please contact us for current lead times as they may vary based on in house volume. Please contact us with any questions and for pricing and estimates! ALL ORDERS MUST BE ACCOMPANIED BY A COMPLETED ORDER FORM.